In 2018, iDisciple, Christian Cinema, Family Christian and Dove.org joined forces to create Giving Company, a global faith and family media network. Together, we’re serving faith-oriented families around the world. We believe we’re giving you life-changing content that helps you grow in your spiritual walk and subsequently, through our membership program and the support of our advertising partners, we are able to financially give to charitable partners who are making a life-changing impact in the lives of many all over the world. Working in partnership with World Vision and Crisis Aid International, we are supporting our mission of giving back to underprivileged and marginalized woman and children. With the formation of Giving Company, emerged the Giving Membership. The Giving Membership, formerly iDisciple Premium, is an upgraded iDisciple experience with benefits spanning all Giving Company brands. Giving Members not only benefit from access to exclusive content, removal of in-app ads, and perks like free movie rentals, but most importantly, Giving Members are Giving Company’s greatest catalyst for giving through their monthly or annual contribution. How Does Giving Membership Make a Global Impact? A portion of every Giving Membership is donated to World Vision’s Global clean water efforts. Through a partnership with Giving Company and World Vision, World Vision is able to bring clean water to those in need and work to end the global water crisis by 2030. Through the generosity of our paid members, Giving Company has been able to provide clean water for life to over 5,200 people! What are the perks of Giving Membership? Early access to New iDisciple content like growth plans, podcasts, music and more. See it before anyone else does! How do I sign up to become a Giving Member? 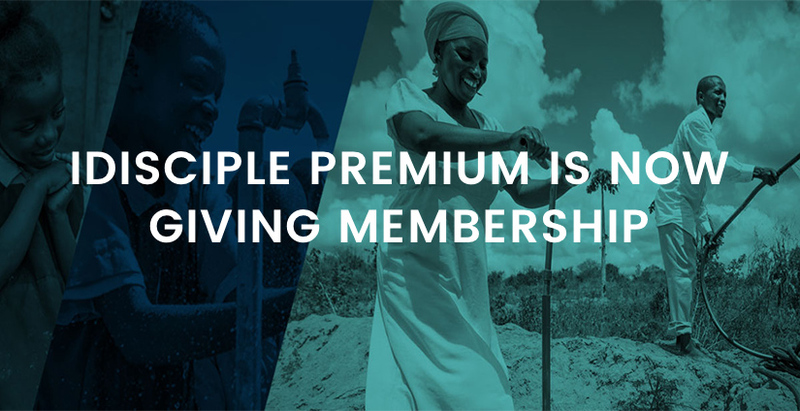 If you’re already a registered free user on iDisciple, click here to upgrade to a Giving Member now. If you’re not a registered free user on iDisciple, click here to sign up for a free iDisciple account. Once you have a free iDisciple account, click here to upgrade to Giving Membership.